Apple Cider Vinegar for Acne - How Does It Work? Using apple cider vinegar for acne has increasingly become a popular natural route to treating the condition. If you are looking for a way to treat acne, you are not alone. According to the National Institutes of Health, around 80 percent of people between the ages of 11 and 30 have acne outbreaks at some point. Acne is something that most people have had to contend with at some point. Naturally, people want to find ways to address it, prevent it, and help their skin to be clear and beautiful. For some people, that route may include using apple cider vinegar. Using products like apple cider vinegar will help give you clear, beautiful skin. Even if you are not familiar with what apple cider vinegar, often referred to as ACV, is, you have probably heard people discuss it. That’s because it’s something that has been touted for helping to address everything from type 2 diabetes to helping people to lose weight to getting rid of gastrointestinal discomfort. The benefits of the substance have been discussed by many, including using apple cider vinegar for acne. In a study published in the journal Medscape General Medicine, researchers looked at the medicinal uses of apple cider vinegar, as well as the history of people using it. They report that it has been used for over 2,000 years to flavor and preserve foods, heal wounds, fight infections, clean surfaces, and to manage diabetes. Apple cider vinegar for acne is just one of a wide range of benefits to this powerful natural elixir. Vinegar, as they explain, means “sour wine,” and it can be made from fermenting a carbohydrate source, such as dates, apples, pears, grapes, berries, melons, beets, and more. Apple cider vinegar is made by fermenting apples. During the process, yeasts ferment the apples’ sugar to alcohol, then acetic acid bacteria converts the alcohol to acetic acid. It is produced by either a fast or slow fermentation process. If this sounds like daunting information, don’t worry, you will not be quizzed on this information, nor will you need to know how to create it to use apple cider vinegar for acne. Today, it’s readily available in most grocery stores, it’s affordable, and it has many uses, including using it to treat acne, to help with acne scars, and to tone the skin. Takeaway: Apple cider vinegar has a long history of being used for a wide variety of medical conditions. Even Hippocrates, considered to be the father of clinical medicine, was using it to treat wounds back in 420 BC. It’s an all-natural product that has many benefits, including many people touting apple vinegar for acne. What makes apple cider vinegar so powerful is that it contains acetic acid. According to the U.S. National Library of Medicine, acetic acid has both antibacterial and antimicrobial properties. What this means is that it is going to be beneficial for killing acne-causing bacteria. Apple cider vinegar is also used by some people as a natural astringent, helping to restore the skin to a proper pH balance. Applying apple cider vinegar to your acne may help get rid of it by drying it out, as well as by killing any acne-causing bacteria. It’s important to note that there are many people and websites that tout the great benefits of using apple cider vinegar for acne, but there is not much scientific research to back it up. The research for or against using it for acne just hasn’t been done, so most people have to rely on their own experience in using it to see if it helps or not, at least until there is research conducted on it to see what the scientists have to say about it. You can, however, take comfort in knowing that it is a home remedy that has been used for thousands of years for a wide variety of conditions. Our ancestors were using it long before there were scientists in labs carrying out experiments to try and prove, or disprove, the validity of something. Takeaway: Apple cider vinegar contains agents that help to kill bacteria, as well as restore one’s pH balance of their skin when used topically. Many people use it as a natural astringent. The science on using apple cider vinegar to treat acne, however, is still inconclusive at this point, as more research is needed to confirm its benefits of addressing acne. When it comes to purchasing apple cider vinegar, you will find that it’s affordable and easy to find. Most grocery stores carry it, usually found down the baking or condiments supply aisle. When you look at what is there, you will see you have a range of options. There are name brand options, generic brands, and you will find some that are organic. It may make you wonder if it matters which one is better to use. After all, if you are going to use this to have beautiful-looking skin you want to make sure you get the right one from the start. That will give you a head start in having clear skin that looks healthy. Purchasing organic apple cider vinegar for acne is going to cost you more, so it’s important to know if it’s worth the additional expense. 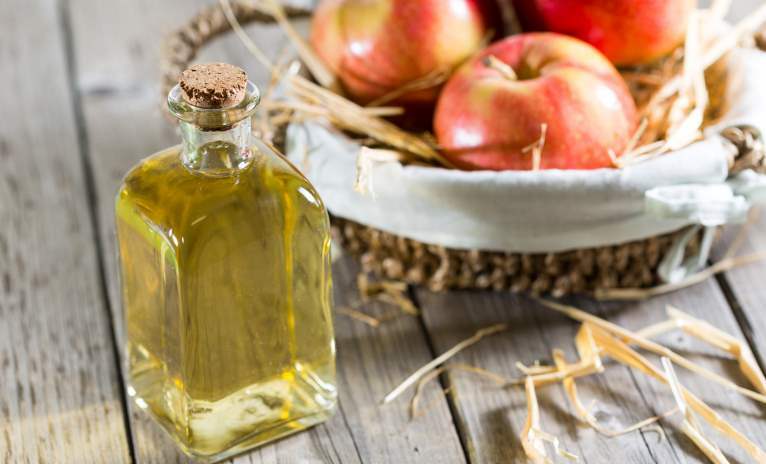 In a study published in the journal Food Technology and Biotechnology, researchers compared the acetic acid bacterial microbiota in organic and conventional sources of apple cider vinegar. This was the first study of its kind, and researchers concluded that the organic apple cider vinegar was clearly more diverse than the conventional source. In light of that, and knowing that by choosing organic apple cider vinegar you are helping to avoid putting harmful chemicals on your skin, it’s a good idea to stick with the organic version. When purchasing your apple cider vinegar, it is also important to make sure that you choose one that states it is with the “mother.” If it has the mother with it, you will be able to see things floating around in it. That substance is where the good stuff lives, as it is a colony of beneficial bacteria. Apple cider vinegar with the mother means that it has been unrefined, which is exactly what you want to use, whether you are using it on acne or for weight loss. If you buy a larger bottle you will save even more money, and you can use it for some of the additional benefits it provides. Takeaway: When it comes to the properties that are in apple cider vinegar, they do vary when it comes to comparing organic to conventional. Organic apple cider vinegar is more diverse, making it a better option for treating acne. If you decide to try apple cider vinegar for acne, spend the little extra to get the organic variety. No matter what you are considering using apple cider vinegar for, it is important to be aware of the safety precautions. Using it can be problematic for some people, especially if you have very sensitive skin. There have been numerous reports of people experiencing burns on their skin from using this product. It’s always a good idea to exercise caution and be aware of any potential downside to using a particular product. This is especially true when you are considering using apple cider vinegar for acne, because you are trying to clear your skin up, not make it worse or add a burn to the problem. In a study published in the Journal of the American Academy of Dermatology, researchers shared their findings from a chemical burn that happened from using apple cider vinegar. They report that burns can happen with weaker forms of acid, including from acetic acid, which is found in apple cider vinegar. They shared findings from a young patient who had experienced burns after his mother had used apple cider vinegar, which had been soaked into cotton balls, topically. The person was diagnosed with a chemical burn that was caused from topically applied apple cider vinegar. The Environmental Working Group, an organization that keeps a database with information on the safety and toxicity of cosmetic-related products, also reports on apple cider vinegar. According to the health concern information they provide, the overall hazard of using it is considered low. However, they do report that it can be used to balance the pH in cosmetics, and that vinegars are strong acids that can lead to irritation and skin damage if they are used in excess. If you will be using apple cider vinegar for acne, it’s important to use it as recommended, to avoid using it excess, which can lead to more problems than the acne you are trying to address. Takeaway: While there are many reports of the beneficial uses of apple cider vinegar, it is still important to be aware of safety precautions. The acetic acid found in it does have the ability to cause a chemical burn, even though it’s weaker than other forms of acid. When using apple cider vinegar to treat acne, it’s important to always dilute it, and possibly avoid it if you have very sensitive skin. Cleaning your face daily with apple cider vinegar will help remove dirt and remove acne. If you have acne issues and you are looking for an all-natural, affordable option to help you address it, you may want to try using apple cider vinegar. If it doesn’t work for you or you don’t care for the strong smell that it has or you don’t like what it does for you, then you will not be out much. It’s important to remember to not use it on your acne in its full strength, which would be too harsh and could damage your skin. Purchase apple cider vinegar at the store. You can pick it up at most grocery stores and markets. Opt for one that is organic and with the “mother.” What it means by being with the mother is that it has all the particles floating around in it. You want it to be organic, unpasteurized, and unfiltered. That way it is in its purest, most natural state and has the beneficial properties you are after. Find a small container, preferably made of glass, which has a lid. It can be a small jar or pot. You will use this to store your diluted apple cider vinegar for acne. By keeping a small jar of it made you won’t have to go through the dilution process every day when you want to use it. When making the combination of what you will use on your face, be sure to use one part apple cider vinegar to three parts water. So using your container or a measuring cup or spoon, put in one third of it as apple cider vinegar, and two thirds of it water. Mix that together. If possible, use filtered or distilled water to mix with the apple cider vinegar. Using a cotton swab, use the mixture on your face and let it dry. Once it has dried, you can go ahead and use other lotions or things that you would normally use on your skin to keep it nourished and hydrated. Use the apple cider vinegar for acne twice daily for the best results. Be sure to monitor the progress it is making on your skin. How much you use largely depends on how sensitive your skin is. You may need to make adjustments to dilute it more if you have very sensitive skin or feel that it’s irritating you. Essentially, this is a recipe for creating your own apple cider vinegar toner. It’s easy to use, you can keep it handy by making it in your own jar, and you will be able to help clear up your skin and make it beautiful. After using it for a couple of weeks, you should see a noticeable difference in your skin. It should feel softer, the acne should be clearing up, and your skin should be looking nicer. If you are not seeing that or it looks worse for some reason, you may want to use a highly rated acne treatment product with it, or search for additional adjustments you can make to get the combination just right for your particular skin. Takeaway: It’s easy and affordable to make a homemade toner from apple cider vinegar. Using it daily will help you remove dirt, dry up acne, and balance your pH level. It’s important to start with this basic recipe for making the toner, but then adjust as you need to for your particular skin type. Notice the results that you are getting to determine if you need to make adjustments or if you have the perfect combination. While on your mission to use apple cider vinegar for acne, you may also want to consider using some highly rated acne treatment products. They can be used in conjunction with the apple cider vinegar. Just be sure to let the apple cider vinegar completely dry before using these products. These will help to keep the skin nourished and moisturized. Whether you have success at eliminating the acne with the help of an additional product or on their own, the important thing is that you will be clearing up your skin. The first step to clear, beautiful skin is addressing the acne. Here are a few highly rated products on the market to consider. They each address acne and are made with ingredients that will also give you softer, more beautiful skin. Exposed. Those looking for a highly effective complete acne care treatment system opt for the one offered by Exposed Skin Care. It provides everything someone needs for beautiful skin. You get the tools needed, too, so you are not buying multiple products. It provides all you need to cleanse, treat, and moisturize, all without drying out the skin. The system also has a microfiber cloth with it, so you can do gentle exfoliating, as well as a probiotic to help provide your body with beneficial bacteria that will help fight the acne from the inside out. Of those who report using the system, 98% of them report that they saw results within just 30 days. Keeva. This is a popular product for addressing acne. It contains one of the most powerful essential oils for treating acne, which is tea tree oil. The tea tree oil is mixed with a blend of other natural ingredients to create an effective solution to help clear up skin. Users report that it works quickly, and it helps to balance the skin so that it’s not dry or oily. You can also use this product to treat scars from acne. Essy. A very popular product, Essy contains a mixture of all-natural ingredients, including things like aloe and ginseng. Not only is it powerful at helping to address acne, but it will help restore skin to its natural beauty. Users give this acne treatment cream great reviews, keeping it one of the top-rated products. Q. Can you use apple cider vinegar for acne? A. Yes, you can and many people have had success with using it. People use it on their skin for clearing up acne, as well as a toner to help achieve beautiful skin. Q. What type of apple cider vinegar should I use for acne? A. Always opt for organic apple cider vinegar that is with the “mother.” You want the product to be unfiltered and unpasteurized, so that it is in its most natural state. You will get more beneficial properties by opting for organic varieties over conventional ones. Q. How much apple cider vinegar should I use on my skin? A. Creating a toner to use on your face comes down to how sensitive your skin is. Ideally, you can start with one part apple cider vinegar to three parts water. If you have sensitive skin, you may need to make adjustments to the ratio to dilute it more. Avoid using straight apple cider vinegar on your face, as there is the chance that it can cause burning and irritation. Q. Are there some people who should not use apple cider vinegar to treat their acne? A. Yes, those with very sensitive skin may find that using it is too harsh. They can try diluting it more to see if that is more comfortable, or they may need to avoid using it for acne. I Used Braggs organic apple cider vinegar and my 7yr aggressive acne cleared out. Im not kidding.